It is a beautiful sunny day with a strong breeze that keeps Mexico City’s well known smog from settling in and we have a wonderful view of the different neighborhoods from the upper deck of the Turibus. However at times, there is an element of danger as we pass under trees whose limbs smack us across our forehead if we don’t duck in time. 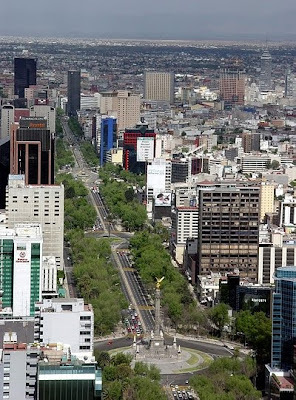 The centre of the city was designed and built in the 19th century by the Emperor Maximilian, a Frenchman of enormous wealth and very little intellect, who somehow found himself in Mexico. He was homesick for France and decided to build a city that reminded him of his beloved Paris. In this he was successful and today the boulevards, parks and buildings all remind us of that fabulous city. Alongside these European streets are some wonderfully evocative Art Nouveau and Art Deco buildings that rose up during the City’s renaissance during the early 20th century. There are walls of Tiffany glass and stunning Diego Rivera murals, and entire suburbs of wonderful art deco architecture. Other wealthy suburbs are full of impressive 18th and 19th century houses and mansions. But Mexico City also has its less glamorous side and we pass through areas that are in stark relief to the magnificence of the main streets. Many of the areas, just a couple of streets away from the European boulevards, are extremely poor , with shabby run down buildings of indeterminate age, shoddily built with cheap materials that blight the streets with their uncared for exteriors. In fact a large percentage of these buildings appear to be derelict. It is interesting to note that the endless small apartment buildings of the mid 20th century are not handling the ravages of time nearly as well as their older counterparts. This entry was posted in local architecture, local history, Mexico City, travel guide, travelogue. Bookmark the permalink.